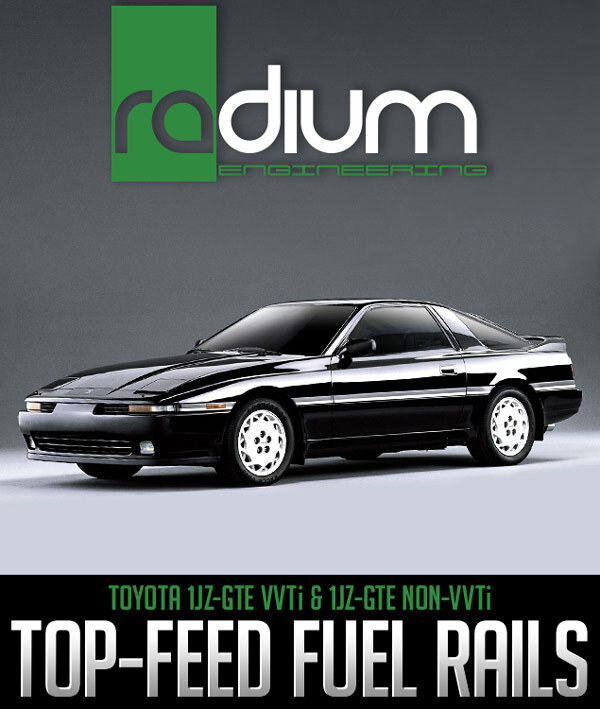 Radium’s 1JZ-GTE fuel rails allow for the addition of high flow aftermarket fuel injectors and deliver precision fitment to address the tight tolerances found in common aftermarket top-feed fuel conversion kits. These extruded 1JZ-GTE fuel rails have a large 0.69-inch internal diameter bore to supply massive fuel volume for high horsepower engines. The rails are CNC machined from 6063 aluminum, black anodized, and laser etched for a high quality surface finish. Both fuel rail kits are compatible with all fuel types including popular alcohol mixtures such as E85. The rails have three machined ports (2 end ports and 1 center port) that are tapped with 3/4″-16 female threads (-8AN ORB). The center port can be used as a feed, return, or auxiliary port for a fuel pulse damper or a fuel pressure sensor by using adapter 14-0119 (sold separately). NOW ON SALE! $189.95 CLICK HERE for more info.